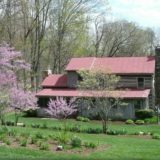 Authentic 1813 log cabin with amenities, gardens, 2,000 square foot game room and additional buildings. 15 minutes from downtown Lexington. 3 night minimum. Sleeps 10. $650/night.